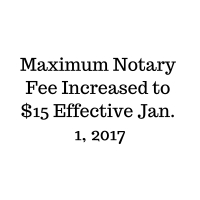 Notary fee per signature in California has been increased to $15 from $10 beginning January 01, 2017. All notaries are required to charge no more than $15 per signature notarized, however they are allowed to charge less than $15 per signature. Expect UPS stores and the like to adjust their fees to be $15 per signer, per document effective immediately on January 01, 2017. Our fees will remain unchanged currently. Our regular pricing schedule and fees are the same, and you can expect your usual fees with us to be unchanged by the change in California Notary fee law currently.